The Astronomer and I rarely go out for steak, but when we’re craving a big ‘ol slab of red meat, we go big. 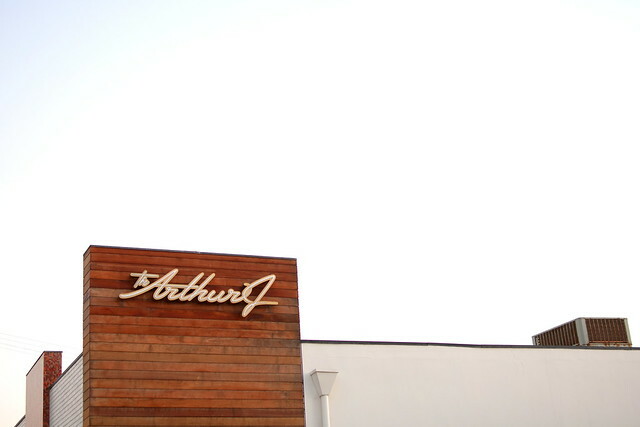 Two Saturdays ago, we booked a sitter for June and made our way to Manhattan Beach to finally try Chef David Lefevre’s The Arthur J. 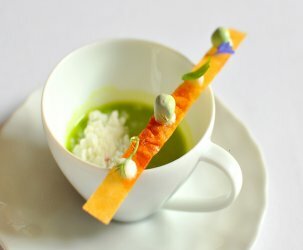 We are tremendous fans of the chef’s two other spots in the neighborhood, M.B. Post and Fishing with Dynamite, and were confident The Arthur J would offer similarly fabulous fare and fun. It must be noted that The Arthur J is a beautiful restaurant. 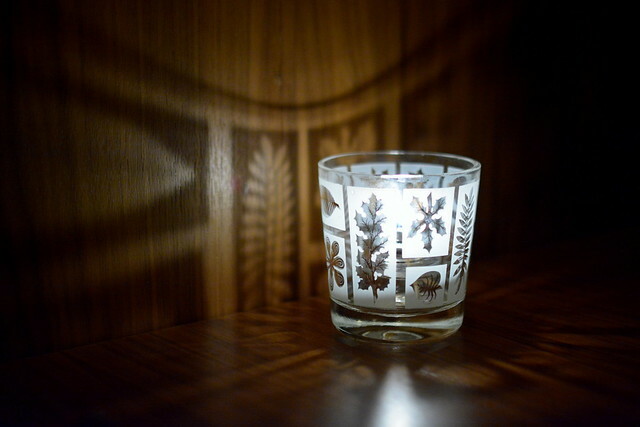 The combination of dark, moody lighting and mid-century furnishings set the perfect tone for a lovely night out. To start, a glass of Prosecco ($13.50) for me and a cocktail for The Astronomer. 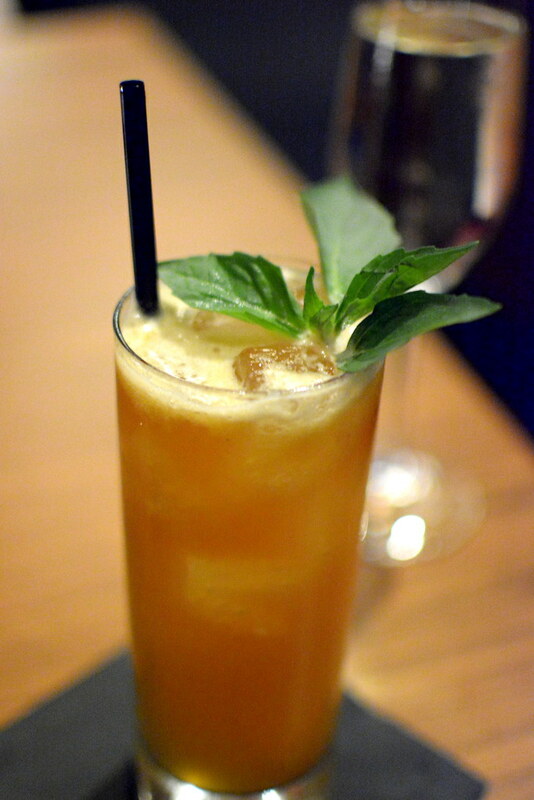 He selected the “Captain Warburton” ($14.50), a Dark and Stormy made with house-made spiced rum, Thai basil, kiwi, and galangal. As anyone who has ever tasted the bacon cheddar buttermilk biscuits at M.B. Post or the Cape Cod squash rolls at Fishing with Dynamite can attest, Chef Lefevre is a masterful bread maker. So obviously, we had to order both varieties of bread on the menu. 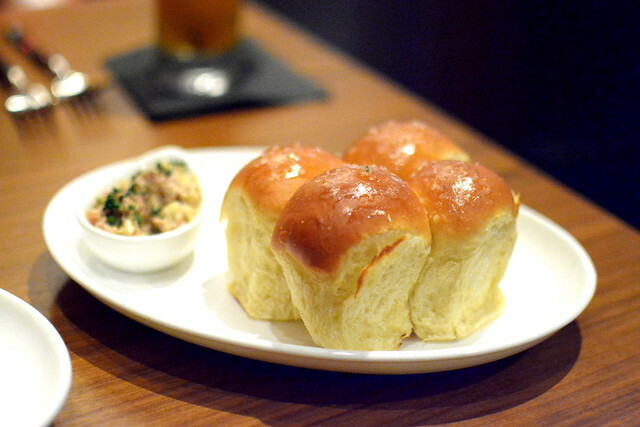 The Parker House Rolls ($6) were exactly as the menu promised: “golden buttery outside, soft warm inside.” The deviled ham served alongside was gratuitous but wholly welcomed. 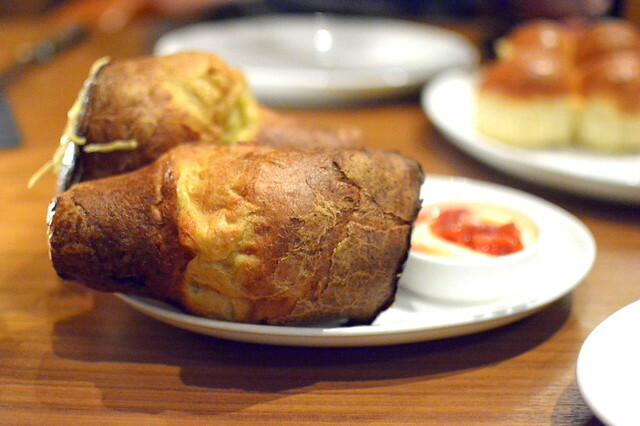 The Emmental Popovers ($6) were impressively puffy—crispy on the outside and nearly hollow within. Served on the side was a dish of strawberry butter for “dipping.” Yes, dipping. 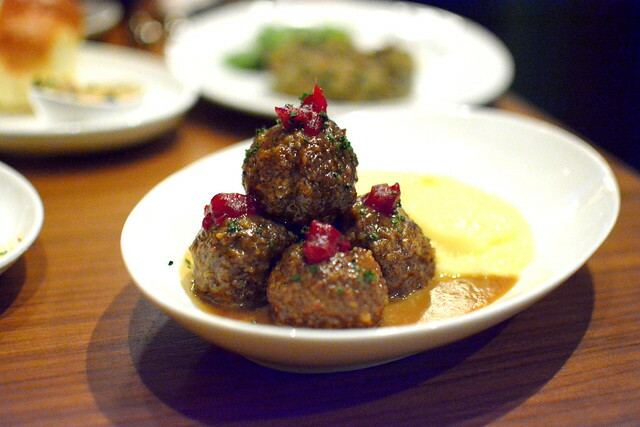 Also on deck were the Swedish Meatballs ($15) served with potato puree and cranberry-kumquat preserves. These were perfectly fun to eat and very good. 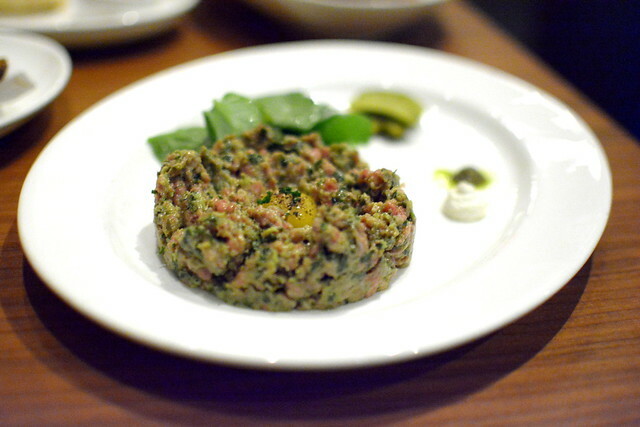 Rounding out our starters was a classic rendition of Steak Tartare ($17), beef sirloin punctuated with a quail egg and green peppercorns, and served with rye toast. The star of the evening was the 22 ounce prime Kansas City Strip Steak ($85) that The Astronomer and I shared. 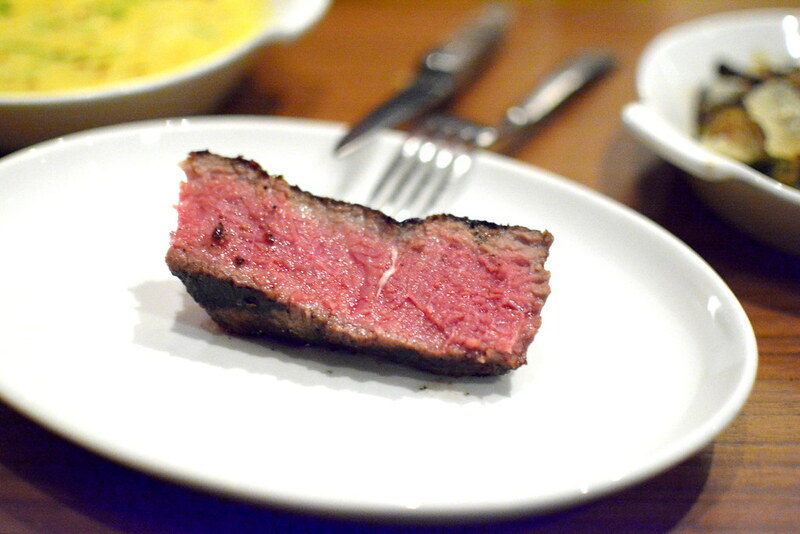 The thicker bone-in cut, dry-aged for 28 days, was cooked over a wood-fire grill to an ideal medium-rare. 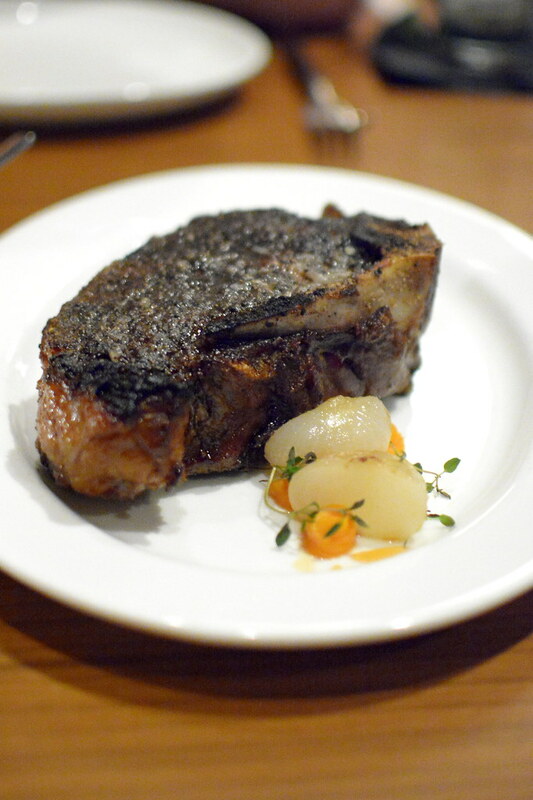 The char was impeccable while the meat of the matter was pure, teeth-gnashing caveman goodness. 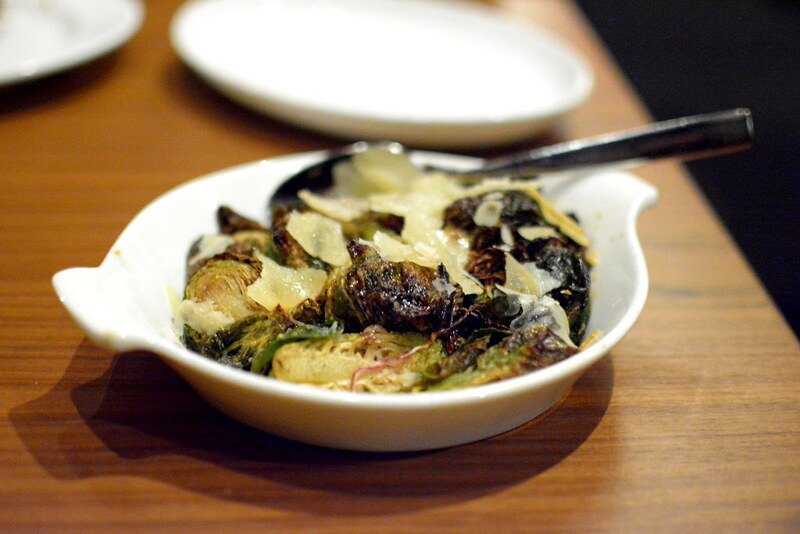 …as well as Brussels sprouts ($9) with dates, red onion, and bianco sardo. 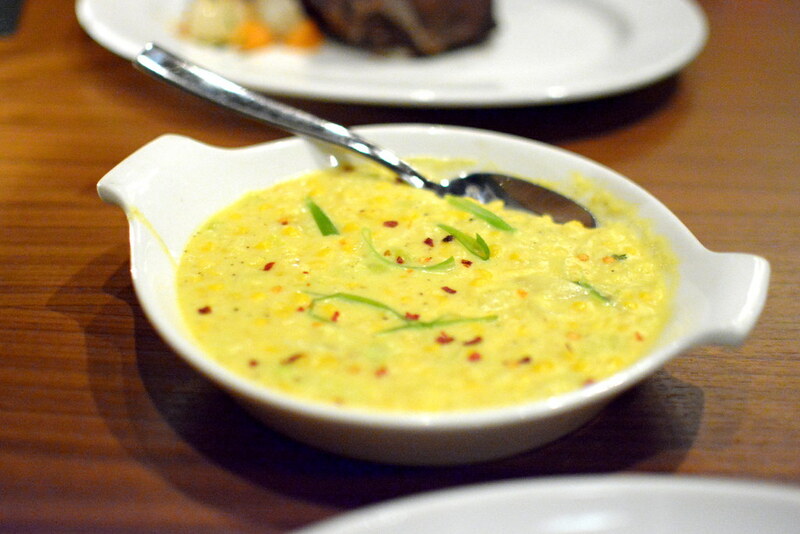 I loved how both side dishes teetered between savory and sweet. 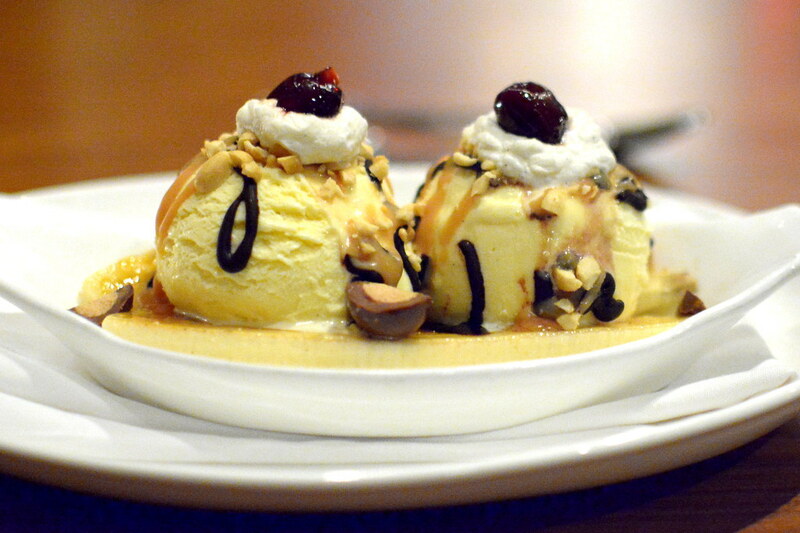 For dessert, The Arthur J Sundae ($12), a gussied-up rendition of the classic dessert with caramelized banana, salted peanuts, fudge and caramel sauces, whipped cream, and Luxardo cherries. The Arthur J delivered on all fronts. 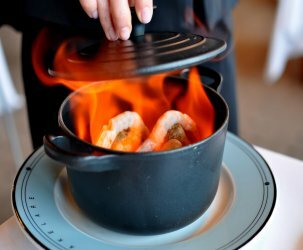 From the starters to the steaks and sweets, I was impressed by how every course struck a masterful balance between classic execution and modern flare. 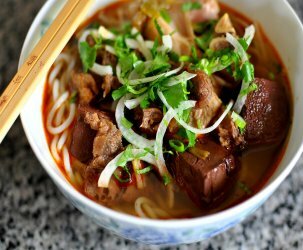 Everything old is wonderfully new and fresh again at this seaside bastion of great meat. Such an indulgent meal — thanks for letting me live vicariously through your words and pictures!